Gorgeous pink or white, natural soy and cotton wick candles, in glass tumblers imbued with the pure essence of The Pink Room Parfum No 1. Creates a warm, silky feeling in your environment. 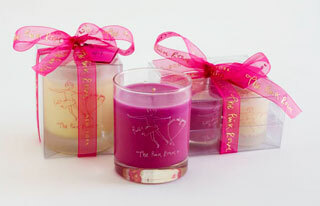 Votive candles in gorgeous pink and white pure soy with cotton wick, imbued with the pure essence of The Pink Room Parfum No 1. Create a warm silky feeling in your environment. Small enough to accompany you on your travels and glamourize your hotel room.